Most parents can agree that a pack n play must be sturdy and easy to open or convert. That was our top criteria for selecting the best pack n play. If you want to cut to the chase the Evenflo Portable Pack n Play scored well above the other pack n plays we tested in every category and is our top pick. 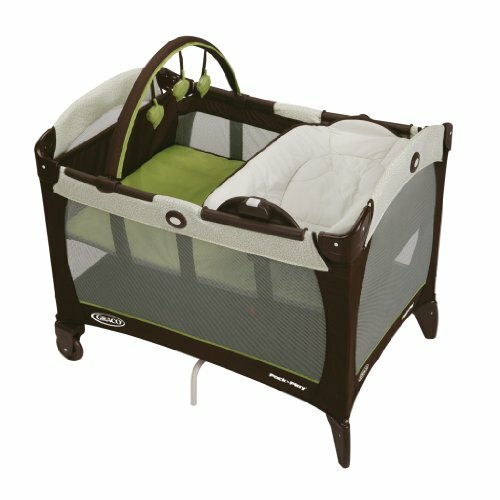 This convertible play pen offers parents several levels of use starting with the bassinet as an infant up to 15 pounds. Pack n Plays are designed to give your baby a safe and portable space that is ideal for playing and napping. Dependent upon how you will use your playard there are a number of options that you will find useful. Many parents choose to purchase one to use as a “care station”that stays in the home, as well as a second more lightweight version to take on the go. The term Pack n Play is interchangeable with the term playard. They come in a number of different sizes, colors, and styles, so if you choose to keep yours at home then choose something that matches your decor. You can also enjoy amazing features such as a detachable changing station, bassinet, and fun toys and sounds. No matter what style you choose, you’re going to find that owning a pack n play is going to contribute hours of cozy entertainment for your child in a safe setting. Before you buy, take a look at the most popular models on the market, that so many parents swear by. The Evenflo Portable Baby Suite is a veritable amusement park for you child. If you want the ideal space for your baby to sleep, play, and explore then you’re going to love this pack n play set that provides a full size bassinet that meets all your child’s needs. There’s a removable padded floor mat that converts to a tummy time play mat with a fun attachable toy bar, providing a clean space for your baby to safely play and rest. What’s great about this set is that it’s completely portable, allowing you to take your baby’s favorite fun space on the go, and with the matching carry bag you’re going to find that traveling with the Evenflo is a breeze. It’s recommended that the playard only be used by babies who are young enough to not be able to climb out at any time, and who are less than 35 inches tall and less than 30 pounds. You should also not use the bassinet feature if your child is over 15 pounds. Those recommendations aside, this is a wonderful pack n play that is stylish and designed for everyday use. The color is lovely, and should fit nicely into your home decor or baby room. Owning a suite such as this is a wonderful idea if you want a convenient and customizable environment that is safe for your baby to play and explore. There’s nothing more reassuring for a parent than knowing that their baby has a spot that is entertaining and fun, and also great for resting and having tummy time. Evenflo is a trusted name when it comes to baby products, and this pack n play is a wonderful example of why parents love the brand so much. This is one of the most highly rated portable play areas of its kind, and parents love it because it’s safe, effective, and made of durable materials. This is perhaps one of the most widely used pack n plays that you’ll find on the market. Graco is one of the most popular brands when it comes to products for your baby, and there are a number of key features that make this pack n play stand out from the rest. In fact, the inventors at Graco actually invented the pack n play, so you know that they are the most tried and true. The company prides itself on always coming up with new ways to make baby gear that helps make life easier for the parents, and more enjoyable for the babies. This playard features a reversible napper for when baby needs to nap and a changer, all in one. The multitasking nature of this piece adds convenience to your life, and comfort for your baby. What parents really applaud about this piece is that it’s wonderful to be able to convert from a napper to a changer in no time, thanks to the simple push and lift motion. The pack n play is built to be sturdy and secure at all times, and designed to be simple and easy to convert. What Graco has termed the Newborn Napper Station is beautifully appointed with stylish fabrics that cuddle the baby and keep them cozy. The soft material feels nice against baby’s delicate skin and helps them to sleep more soundly. Also, the fabric will always stay clean and tidy thanks to the wipe-clean materials that resist mess. What you also get with this playard is a removable toy bar with soft toys attached for a fun play time and plenty of visual stimulation for your child. You’re going to enjoy watching your baby giggle and laugh at the fun toys that float over their head. What also comes included is a removable bassinet, making this the ideal cozy sleep spot. All in all, there’s a reason why this is one of the most popular pack n plays on the market. When parents want the best, they go with the original from Graco. This is a wonderful mini nursery from the designers at Safety 1st, that you can use at home or take on the go. The pack n play is designed to keep your baby happy and comfortable. The well appointed newborn set provides a wonderful resting place for your child and features open-view breathable mesh so that you can clearly see your child no matter where you are in the room. All the materials on the Happy Space are wipeable and there’s also a deluxe organizer to safely stow all of baby’s necessities such as diapers, bottle, or extra toys. The bassinet features two wheels, making it easy to move the piece from room to room in no time. What you get with this playard is the power of mobility. With the included carry bag, you can pack this yard up in no time and take it with you when you travel. That means that your baby will always have their favorite comfy and safe spot no matter where you go. Your baby is sure to love the entertaining toy arch that comes with two soft, adorable toys which will make baby laugh. The yard is designed to be very spacious, giving your child all the room they need to wiggle, rest, and enjoy tummy time. You would think with all these features that the Sweet Wonder would be hard to set up, but it’s in fact quite easy to assemble and disassemble it in no time. What makes this piece from Safety 1st stand out is that it provides all the comfort of a bassinet, with the convenience of a convertible pack n play. That yard may look large, but it is truly easy to pack it up and take it on the go. Parents love this yard also because it comes in fine, neutral colors that work well in any home or baby room decor. Enjoy the comfort and convenience of owning a convertible bassinet that functions as an all around fun and safe play area for your baby. We’ve highlighted the very best rated pack n plays on the market, so now it’s time for you to find the perfect model for you. To begin, you want to explore what various features are available to you, and which of these are most important for your child. There are countless models on the market, so to narrow down your search be sure to ask yourself some key questions about what you’re looking for and how much you’d like to spend. No matter which pack n play you choose, you’re going to be amazed by the added convenience and safety that it provides. Now you can finally give your child a safe, comfortable place to play while you remain nearby but get things done around the house. A quality pack n play is also wonderful for trips to grandmas house, allowing you to put the baby in their play pen while you socialize and have your attention elsewhere. What is a Pack n Play? New parents can feel slightly overwhelmed by all the equipment that they should buy for their baby, but when it comes to purchasing a pack n play, you’re seriously getting a lot of bang for your buck. This handy device is particularly great if you take your baby on trips a lot, as they’re easy to pack up and carry with you. Also known as play yards, pack n plays are designed to be easily collapsible, giving you a portable and safe place for your baby to play and rest. Unlike playpens that were traditionally square, the play yards of today are rectangular in shape and have fun extra features to keep your baby amused, such as mobiles, detachable toy bars, and even entertainment centers that play music, nature sounds, and have fun blinking lights. What makes these play yards so convenient is that they also convert into changing stations, providing you with a changing table insert or attachment that flips into position from the side. As you begin your search for the right pack n play for your baby, you’ll find that prices range a great deal, so ask yourself how much you’re willing to spend. They also vary in weight, with the typical version coming in at about 24 pounds. You’ll find that playards come in two different types: basic and deluxe. The basic version is very lightweight and will not come with extra features such as mobile and changing station. The deluxe models will often come with a bassinet and changing station, as well as toy bars, music and even canopies. The beauty of owning a pack n play is that it’s portable and can fit through any door. That way you can move it from one room to another, or easily fold it up and place it in your trunk. The basic version is definitely more convenient to take on the go because it’s lightweight and designed with mesh on all sides. Often these playards also come with a travel bag to make it even more portable. Because the basic model does not have as many features, it’s also easier to carry. Should you be someone who travels a lot, and you require a safe and cozy place for your baby no matter where you are, then you might want to consider the more basic design. If you’re willing to spend a bit more money, and you require something more high end with added features, then you should choose a deluxe pack n play. This more advanced piece usually features a removable changing table and organizer to hold diapers, as well as a bassinet. If you really want the most advanced option, then find a pack n play with such features as vibrating mattress, canopy, electronic mobile, console with music, and fun nightlight. All of these added bonuses can be yours if you’re willing to spend a bit more, and carry more weight. If you want to frequently move your play area from room to room then you definitely want to check the dimensions of the yard before you buy. There’s no sense in buying one, taking it home, and then finding that you can’t get it through the door. Most interior doorways are about 30 inches wide, and some deluxe models can actually be too wide to get through this space. Granted, these pack n plays are foldable, but if you’re merely moving it from room to room you’re going to get very tired of folding and unfolding over and over again. Finding a pack n play that has a bassinet and changing table insert can be incredibly beneficial. Keep in mind that you should never leave your child unattended within these devices in the yard, no matter what type of feature you’re using. Your baby is always safest sleeping in the full-sized crib, no matter how comfortable they are in the bassinet. If your child begins to move around in the bassinet there’s a chance that they could fall out, and this could cause injury. You also need to remove the bassinet or changing station when your child is in the main part of the yard. It is possible for your child to get stuck under these attachments and this is definitely something to avoid. There are many pack n plays that offer a bassinet that will cover the entire length and width of the play yard. This is a great choice as it reduces the likelihood that your child will fall into the playard. However, a baby could still fall outside of the playard so make sure to discontinue use of the bassinet when your baby is old enough to push up on their hands and knees. Purchasing a pack n play with a removable changing station adds even extra convenience, and usually they are designed to attach to the longer top rail. You will then have to remove it to get it out of the way. Some other models will have the changing station simply rest on the long rails, and they can be easily flipped over the rail to hang at the outer side of the play area. Some believe that it is safer to have a removable changing station so that it’s out of reach of your child. Also, make sure the station has to be manually locked in with a button, snap, click, etc., as opposed to simply resting on a frame. Pack n plays are designed to do what their name suggests: pack it up and move it to a new place. There are many that are meant to be rolled on wheels and fold easily and compactly into a travel bag. The bags usually resemble something like a short golf bag, making it easy and convenient to take on the go. As mentioned above, a basic play station is meant to be smaller and lighter than a more deluxe model, but they unfortunately don’t have all the same features. If you plan to travel often with your baby then you want a pack n play that folds and reassembles with ease. There are some models that require a bit more time to pack up everything, but a well-designed version with folding feet and wheels will be much faster and easier to get travel-ready. Having lockable wheels on your pack n play will make it much easier to move the piece around the house, but do make sure that the wheels lock for your baby’s safety. There are even some models that can roll when they’re folded, which makes it even easier to take from place to place. Many pack n plays will feature a canopy that covers the bassinet, shielding your baby from harsh light. There are even some canopies that have attached toys for your baby’s amusement. Be sure to remove the canopy when the bassinet is no longer in use. Some will say that a canopy is an unnecessary expense because they believe that a pack n play should never be placed in direct sunlight anyhow. Babies burn and overheat quite easily, so be sure to keep your play station in the shade. Some models of pack n play provide storage for toys and other baby things in the form of zippered side pockets, hook-on fabric storage pouches, or clip-on organization bags. It’s not totally necessary to have this feature, but it can be quite helpful. Do be sure that you find a model that has storage large enough to actually hold what you need to carry along with you. Storage pockets should be attached and definitely should connect to the outside of the play area, out of baby’s reach. Again, these features aren’t necessary, but they can be incredibly useful and fun for your baby to have these additions. Some yards have a mobile that holds soft toys or even a detachable baby gym that can be used with the bassinet mattress on the floor for tummy time. Some other bonuses to look out for are entertainment centers that play music, make soothing sounds, and have sparkly lights. Keep in mind that adding these features will jack up the price and make it more difficult to pack up the piece and take it on the go. But if you’re really looking for a mobile activity center, then it’s a good idea to have these add-ons. Owning a pack n play is a great way to get all the benefits of a playard without compromising mobility. It’s a smart choice to put your child safely inside so they can play and enjoy themselves, and if you have to run to the kitchen real quick or answer the phone, you can be confident knowing that your child is safe and entertained. It’s particularly helpful if you have more than one child, as you can tend to one while the other is safely in the play area. Lets explore the key benefits of owning a pack n play before you purchase one for your home. Safe Play: It’s impossible to give your baby constant attention, even though you probably wish that you could. It’s important that you make sure your baby is safe while you do things around the house. Once your baby is placed in the play pen, you can rest assured that they’re safely at play, and it’s even possible to leave the room for a minute or two. Playards are incredibly soft, safe, and comfortable for your child, so there’s never any need to worry. Early Learning: The more deluxe playards feature fun and educational toys and accessories for your baby. Research shows that the earlier your baby begins to learn and play the better it is for their development. 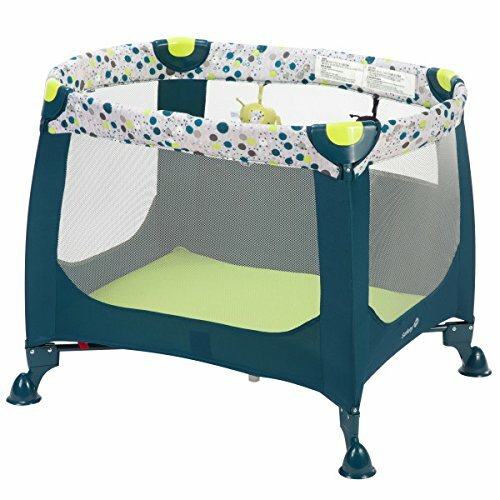 Even the most basic play pens will have some of these features, but to get the most accessories you want to spend a bit more money. This is a smart idea, as the simple act of playing can help your baby develop key motor skills. Staying Nearby: Owning a pack n play is a great way to keep your baby close by while you work in the kitchen, laundry room, answer the phone, and perform other tasks around the house. Because your baby is still close, you’ll be able to see and hear them while they play. This is the safest way to have your child in a confined place while your attention is elsewhere. Portability: All pack n plays are designed to be incredibly lightweight and most will fold up within no time. This means that if you need to move to different rooms in the house you can quickly move the baby’s play pen as well as always have them close by. Also, if you travel a lot, its a great idea to bring your pack n play with you. Many models come with their own travel bag to make the portability even better. Multi-Purpose: A baby’s crib is always the safest place for them to sleep, but if you’re traveling or visiting relatives, a pack n play can be a great substitute for taking naps. Because pack n play pads are thin and firm, you avoid risk of suffocation, and it’s perfectly acceptable for occasional napping. 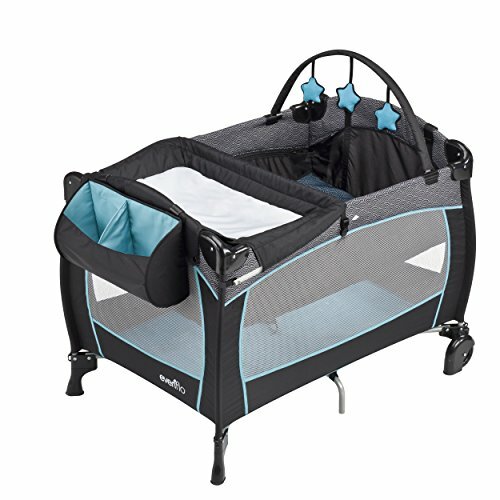 Many pack n plays will also come with removable changing stations, bassinets, and other features that make the pack n play serve many functions. Owning a pack n play is a convenient and safe way to provide your child with a fun play area that keeps them nearby at all times. Lets face it, you’d love to pay attention to your child at all times, but it’s simply not possible. You need to do things around the house, all while keeping your child entertained and cozy. Also, if you happen to frequently travel then you know that it’s great to have a special area for your baby that can move with you on the go. Pack n plays are designed to add convenience and peace of mind to your life, all while entertaining your sweet baby and developing their key motor skills. There are a number of pack n plays on the market, and we explored some of the most popular. Before purchasing one for your home, be sure to do your homework and learn about the various features that these remarkable play pens have to offer.